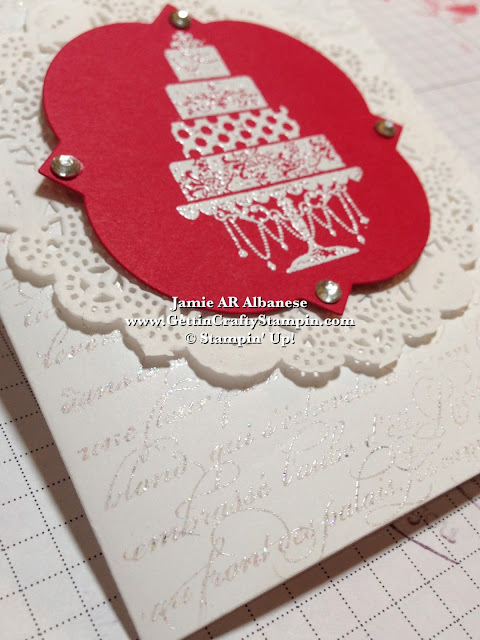 Getting Crafty with Jamie: Red, White, and I Do! Red, White, and I Do! but today I had a mini stamping session and some fun ladies came to play for a quick stamping morning! 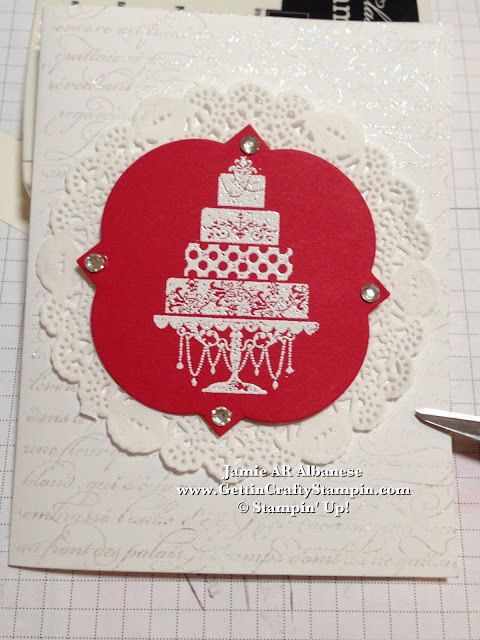 Orfa is a dear sweet friend who created this for an upcoming wedding... as a newer stamper... she blew me away! I wanted to feature this lovely creation... leave me (and Orfa) a comment and let us know what you think!! Red and White may be the colors to the wedding... but I couldn't help the whole 'Red, White and I DO!' lol. 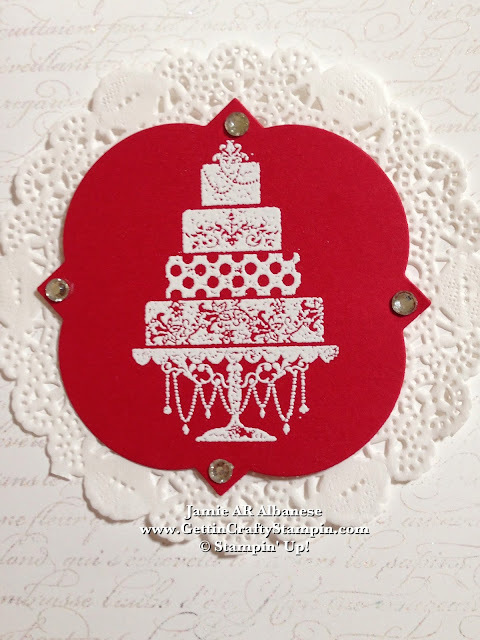 Here with a Whisper White card stock (#100730) base this elegant card comes to life! 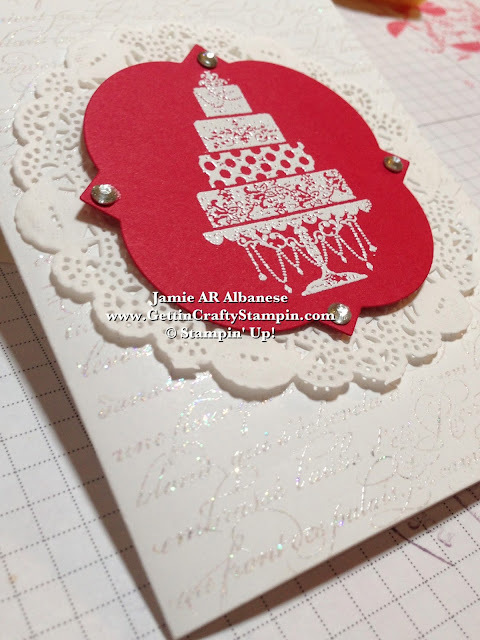 Heat embossing with our Heat Tool (#129053) and Iridescent Ice embossing powder (#101930) our En Francais background stamp for a glittery elegance. Our Tea Lace Paper Doilies (#129399) make a fun and elegant border to this center piece. 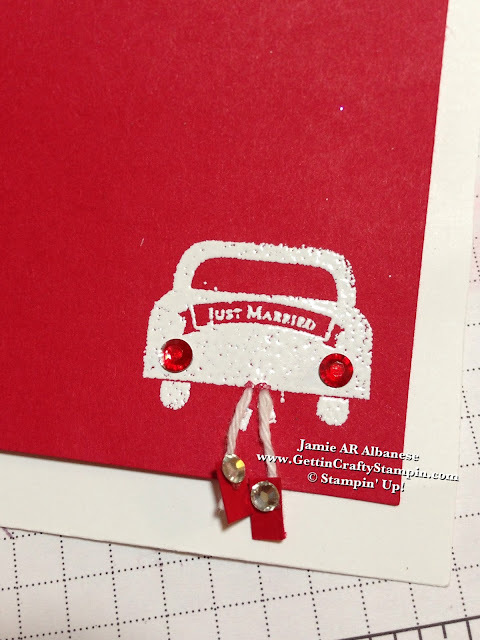 This Window Frames Collection (#129021) Real Red card stock (#102482) and this stunning Just Married stamp set (#129210) pop with the White embossing powder (#109132). Any married couple would be blessed to receive such an elegant card and in their wedding colors! Easy and such fun!! OK So the INSIDE - yes, Orfa added this cute addition to the inside of this card! The red lights are too cute, the hanging cans with bling... Whoot! Whoot! Gooo Orfa! I couldn't be more proud of this new stamper and her mad skills (lol)!! It's fun for a Novice to a Pro... Paper crafting gives immediate results (unlike parenting, lol, marriage, pets, working in an office....)! Take a moment and spend some time with me... I'm a plethora of ideas.. and be amazing at what YOU can create!! CLICK HERE to see my line-up of classes and fun! RSVP ASAP!! CLICK HERE to pick a date for a Private Class... bring the fun to your friends and family while earning Hostess Benefits (and me - lol). Remember to leave us a comment and let me know what YOU Think!! Come and play - who knows, I may feature a card YOU Made on my blog!! Pin this, Email, Facebook, Google+, Tweet and more.. remember that you can FOLLOW ME on all of those and more! This is a fun crafting walk we call life... let's take it together! !